Posted March 10th, 2015 by admin & filed under Uncategorized. I decided to turn a new page as a wife and actually start cooking for my husband and myself. Normally, he would be the cook, but he has fallen into the convenience trap of making a stew or getting take-out – neither very healthy and you get tired of the same old dish all the time. So thanks to the Huisgenoot – which I buy religiously every week – I have turned into a good old chef. You see, they have weekly recipes that include a Meat Free Monday and a special Friday recipe. Even better is that you save a whole lot of money if you are only two people, as the week’s ingredients/meals tally to R300 and you can pack the left-overs for lunch the next day. Oh, and the weekly recipes comes with a shopping guide, so you know exactly what you need to stock up on. The BEST is that it is healthy! 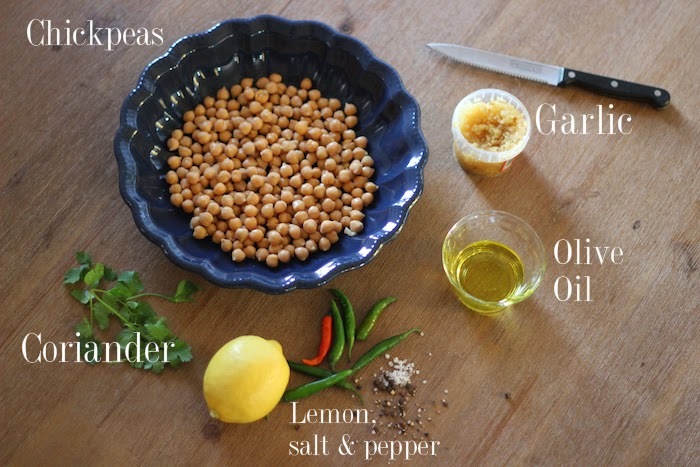 For this salad, you will need – well, first heat your oven to 200 C.
Mix all the above ingredients – do not break the chickpeas – and let it rest for 15 minutes. Cut the tortillas into thin slices and douse in 30 ml olive oil. Season with salt and pepper. Next, lay it out in a pan sprayed with Spray and Cook or Bake and Spray or whatever you like. Put it into the oven until it is golden brown. Spread the leaves in a plate and chop the avo any which way you like. Spread the chickpeas over the salad and add the tortilla chips for that extra crisp. Serve immediately. Side note: I found the recipe to be a little bit tooo spicy, and a little bit tooo sour, so I think the taste can be slightly improved by using only one chilli and only half a lemon. In its defence, this recipe is super quick and super delicious!